The healthcare of the future is heavily dependent on digital and connected technologies. How will this impact care providers, practitioners, and patients? We invite you – as policymaker, healthcare practitioner, patient, researcher or technology developer – who have ideas or experience in how technology can support and advance healthcare. Together, we will do a health check up on the current state and the futures of smart health, identifying new and interesting research opportunities. 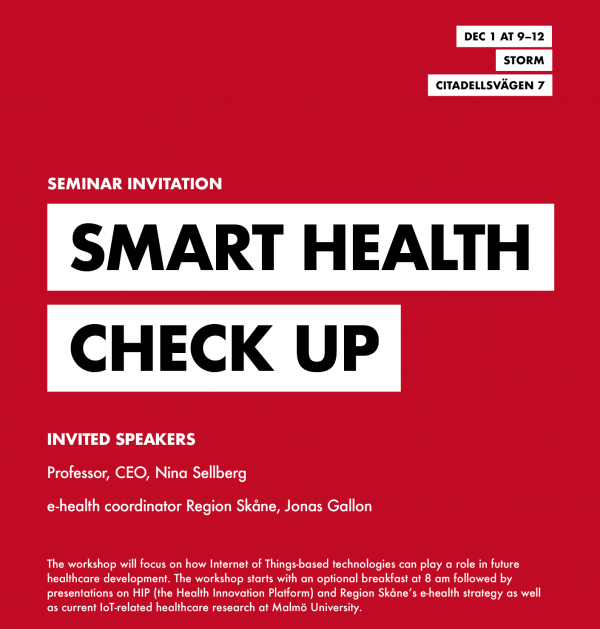 This workshop is hosted by the Smart Health research group at the Internet of Things and People (IOTAP) research center, Malmö University. We explore the application of IoT technologies to the delivery of health-related services, which can, for example, empower patients to proactively engage in their own healthcare and enable the sharing of data to improve treatment outcomes. In this workshop we will bring together diverse actors to identify the most relevant future needs and challenges. Our goal is to identify specific joint research activities and participants that can provide tangible contributions to the future of healthcare in Skåne and beyond. We will start the morning with presentations by leading actors in the Swedish healthcare sector. Central questions we will explore are: How will digital and connected technologies impact care providers, practitioners, and patients? How can patients get access to digitally mediated care? What are the opportunities for the creation of new applications and services within the connected health space? For questions, contact Nancy Russo or Carljohan Orre. The workshop is hosted by the Internet of Things and People research center.